582 records – page 1 of 12. 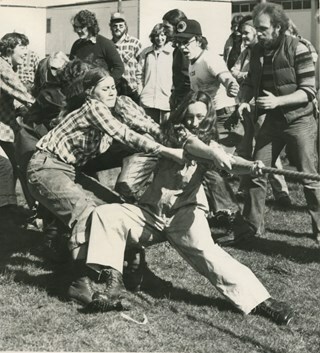 Photograph of a play fight taking place on a lawn. There is a person playing dead on the ground, and two men are standing. One of them is holding a knife over his head as if he was about to strike the man who is down on the grass in front of him. Photograph of Charles Burkman in boots, jacket and cap walking along a railway track with a long tool in his hands sometime between April 6 (when he was passing by Port Arthur, ON) and April 16 (when he was passing by Ignace Ontario) during his cross Canada trip from Halifax to Vancouver. Note in blue point pen on verso of photograph reads: "Cross Country Hike Jan - June/ Between 1921 - April 6, (Port Arthur) Thunder/ Bay, Ontario/ and/ 1921 April 16, Ignace, Ontario"
Photograph of Cice Chandler (later Brown) and her neighbourhood friends standing behind a lawn sprinkler in swim suits in the backyard of Elizabeth Avenue (now Silver Avenue). Photograph of Crichton Hankshaw jumping over a sports net. Caption for photograph reads: "Just"
This portion of the interview pertains to Florence (Hart) Godwin's memories of entertainment on offer during the Depression as well as her overall experience of that time, where she mentions the birth of her daughter in 1929. Recording is a taped interview with Florence Hart Godwin by SFU (Simon Fraser University) graduate student Bettina Bradbury, July 2, 1975. Major themes discussed are: Victoria Order of Nurses (VON) and the Edmonds Historic Neighbourhood. To view "Narrow By" terms for each track expand this description and see "Notes." 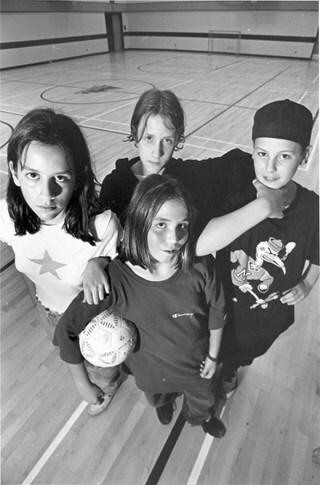 This portion of the interview pertains to Beverley Burrell's memories of school activities such as sports days and band trips, instruments she and her sister played and the types of parties they attended. Recording is a taped interview with Ethel (Leer) Lewarne and Beverley (Lewarne) Burrell by SFU (Simon Fraser University) graduate student Bettina Bradbury June 24, 1975. Major theme discussed is: the Depression. To view "Narrow By" terms for each track expand this description and see "Notes". Ethel Cecilia Leer was born in 1899 in London, England to George Frederick and Sarah Ann Leer. In 1908, the Leer family immigrated to Vancouver, Canada. George Frederick Leer began working for the Canadian Pacific Railway. Ethel’s younger brother George Leer was born about this time. A third child was born but unfortunately did not live past infancy. 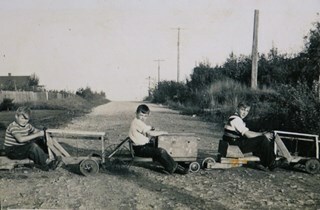 The Leers arrived in Burnaby in 1911 and bought two lots in Alta Vista at the corner of Portland and McGregor. George Frederick and Sarah Ann were active members of the All Saints Anglican Church on Royal Oak. Ethel went to Dundonald school from 1911 to 1913 with Miss Bowell as her teacher, then on to Britannia High School from 1913 to 1915. Ethel’s father, George Frederick Leer died March 23, 1919 at the age of forty-one. Ethel Cecilia Leer married Alfred Lewarne on December 26, 1921 in Burnaby. Alfred was born February 9, 1893 in Cornwall, England. Before marriage he worked for a creamery in Vancouver. After marriage, Alfred began his own ice cream business in Burnaby. The Lewarnes bought a lot along Nelson Avenue and built a house. Their first child Patricia "Tricia" (later McCleod) was born in 1923, their second was Beverley “Bev” (later Burrell). Their third child, William A. “Bill” Lewarne was born in 1926. 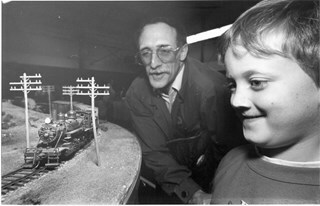 Bill grew up to become one of the most popular Mayors in Burnaby’s history, serving from 1981 to 1987. He also served as a member of Council from 1973 to 1975 and 1977 to 1981. After Alfred Lewarne’s death on May 5, 1962 at the age of sixty-nine, Ethel continued living in the family home. Ethel’s mother, Sarah Ann Leer died May 11, 1963 at the age of eighty-seven. This portion of the interview pertains to Ethel Lewarne and Beverley Burrell's memories of the programs they attended such as PROREC (Provincial Government Organization for Recreation) and going to the Digney movie house. 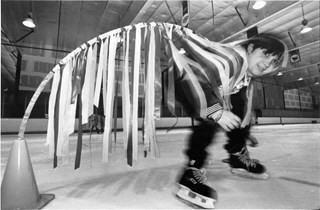 This portion of the interview pertains to Catherine Bertha "Cathy" Rees's memories of the sports activities and other recreational activities that took place while teaching at Burnaby South High School. Recording is of an interview with Catherine Bertha "Cathy" Rees by fellow Burnaby Retired Teacher's Association member Alf Evans, March 14, 1990. This interview was prepared for the Burnaby School History Committee of the Burnaby Retired Teacher's Association. Major themes discussed are: the Depression. Catherine Bertha “Cathy” Rees was born in Greenwood, British Columbia on March 30, 1903. Her mother died when she was four years old and her younger brother Lloyd was only a few months old. Catherine’s family moved regularly because her dad was continually transferred. 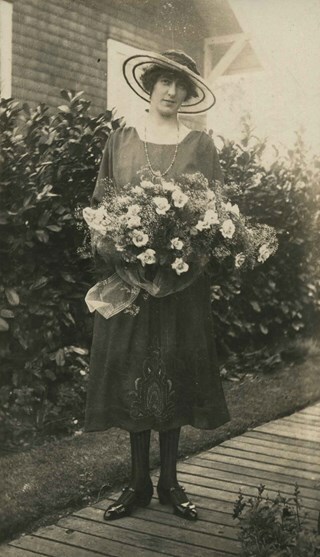 She attended a two room school in Greenwood until grade four, then to school in Kamloops until grade 8, graduating from Duke of Connaught High School in New Westminster in 1919. One of her brothers won a lacrosse championship while at Nelson Avenue School. Catherine started at the University of British Columbia in 1919 and went to Normal School in 1923 (she belonged to the first teacher-training class). Upon graduating, Catherine was offered a position at Revelstoke High School for Physics, French and Latin which she took for a brief period of time. She then taught for one year in Victoria, traveling from one school to the other in a one ton truck to teach languages. For the next two years, she worked at Cloverdale High School. By 1929 Catherine began working in Burnaby where her father and two brothers were living. 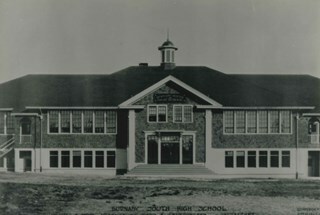 She taught at Burnaby South for her entire career in Burnaby, from 1929 to 1964. Catherine taught French and Latin as well as physical education to the girls (in the basement with two other teachers) and lived at the corner of Nelson and Victory (she still lives there at the time of this interview). This portion of the recording pertains to Don Jantzen's memories of going to supper clubs and participating in sports leagues. Don and Orville Jantzen discuss the Gai Paree Supper Club, the Chicken Coop (the beer parlour where Don's labour meetings were held) and curling at the Burnaby Winter Club. Don Jantzen, [198-]. Item no. 549-040. Recording is an interview with Don Jantzen and his brother Orville Jantzen conducted by Burnaby Village Museum employee Eric Damer, November 19, 2012. Major themes discussed are: political activism and the trade union movement. Don Jantzen came to Vancouver from the prairies following the war, found work, married, and settled in Burnaby in 1950. Through his work as a longshoreman, Don became active in the trade union movement (ILWU) and eventually became vice president of the Vancouver local. He was also active in politics, helping to launch the Burnaby Citizen’s Association in the early nineteen-fifties and working as campaign manager for candidates in both the provincial and the federal New Democratic Party (NDP). Don has been a participant in local politics for many years as well as a supporter of Habitat for Humanity. Don's younger brother, Orville Jantzen, was born in Saskatchewan but grew up in South Vancouver. He is married with two children. Orville began his career as a salesman for a Burnaby bakery and remained in the food and beverage industry, working in British Columbia, Alberta, and Saskatchewan. Since retiring, Orville has been engaged with Canadian National Institute for the Blind (CNIB). This portion of the recording pertains to John Poole and Julia (Kong) Poole's memories of growing up in Burnaby in the nineteen-sixties. Both John and Juila have fond memories of freedom in recreational activities. Julia mentions that they were married at Burnaby Village Museum in 1980. 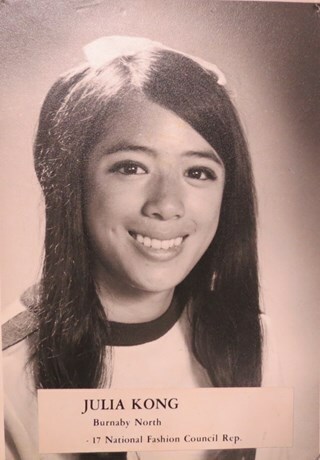 Julia Kong (later Poole) while at Burnaby North High School, . Item no. 549-058. Recording is an interview with John Poole and Julia (Kong) Poole conducted by Burnaby Village Museum employee Eric Damer, November 24, 2012. Major themes discussed are: education and recreational activities of the ninteen-sixties. 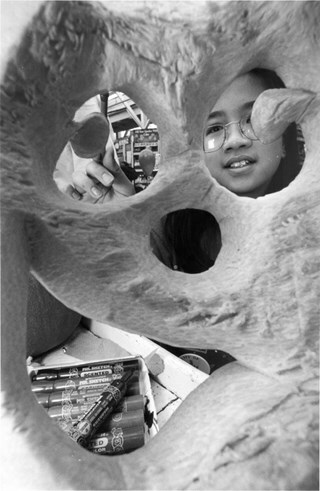 Julia Kong's father moved his family to Capitol Hill in 1953 when Julia was two years old. Julia attended Capitol Hill Elementary and later Burnaby North High School, where she was active in student politics and as a cheerleader. Outside of school she participated in Girl Guides, was an active swimmer, and volunteered in various capacities. After graduation, Julia studied to become a teacher, which included a practicum at Capitol Hill Elementary, and then began a career in education. John Poole, whose father had transferred to the Burnaby RCMP in 1961 when John was ten, attended Burnaby North High School at the same time as Julia, but had earlier attended Schou Street and Lochdale Elementary Schools. 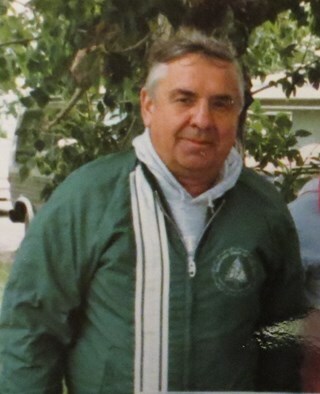 John was active in baseball, soccer, and Boy Scouts, and took a keen interest in cars. After high school he opened a transmission shop in Abbotsford before settling into a career with the Vancouver Fire Department. John and Julia married at the Burnaby Village Museum church in 1980 and began their family roots with their first home on Capitol Hill. They later moved with their three children to Surrey where Julia continues to work for the Surrey School district and John is enjoying his retirement. This portion of the recording pertains to Chiyoko "Chic" (Haya) Tanaka's memories of recreational activities that she took part in. Chic mentions the Cascade Drive-In Theatre and bowling parties at the Capri. She also discusses her father and his political interests. Linda Reid lends her support to the interview. 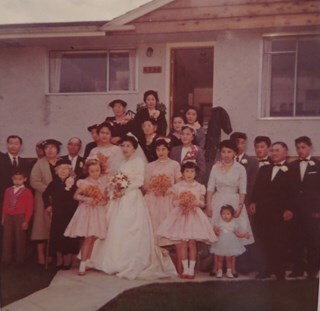 Chiyoko (Haya) Tanaka on her wedding day, surrounded by friends and family, 1959. Item no. 549-075. Recording is an interview with Chiyoko "Chic" (Haya) Tanaka conducted by Burnaby Village Museum employee Eric Damer, November 20, 2012. Nikkei National Museum and Cultural Centre Assistant Archivist Linda Reid lends her support to the interview. Major theme discussed: recreational activities. Chiyoko “Chic” Haya (later Tanaka) moved to Burnaby with her parents in 1957. Although born in Steveston, Richmond, Chic had been removed from the coast with her family during the internment of Japanese-Canadians in 1942. After three years at a logging camp near Taylor Lake, BC, the family moved first to Forest Grove and then to the Great Northern Cannery in West Vancouver. 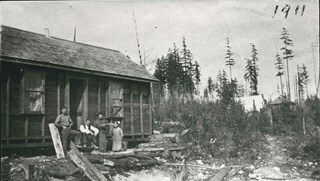 With a loan from the owner of the cannery, Chic's father purchased several adjacent lots in Burnaby near Willingdon and Canada Way and moved his family to a new house soon after. Chic worked in Vancouver at the Bank of Montreal and married in 1959. She and her husband bought one of her father’s lots and moved next door. This portion of the recording pertains to Chiyoko "Chic" (Haya) Tanaka's memories of recreational activities that she took part in. Chic mentions golfing, going to the legion hall, and walking to the British Columbia Vocational School campus (later BCIT) to purchase fresh bread. This portion of the recording pertains to Ken Yip's memories of growing up on a market garden. Ken discusses his favourite things to do in his free time; reading, watching television, operating remote control airplanes. He also mentions his further education in biomedical engineering. Recording is an interview with Ken Yip conducted by Burnaby Village Museum employee Eric Damer, November 14, 2012. Major theme discussed: growing up with a family market garden. Ken Yip's father purchased property on Byrne Road in the Fraser Arm area of South Burnaby under a special plan granted to veterans of the Second World War, cleared the brush by hand, and enhanced the soil’s productivity to create a market garden. Ken Yip was born in 1949. He and his younger brother grew up at the market garden, helping out. Ken attended Riverside Elementary School, McPherson Park Junior High School and Burnaby South Senior High School where he was in the school band. He continued his studies at the University of British Columbia (UBC) and pursued a career in biomedical engineering. This portion of the interview is about Mayor Corrigan talking about living in the Stoney Creek neighbourhood and family walks along the creek. He also talks about Simon Fraser University: working in the Criminology Dept. as a teaching assistant, the university’s architecture, the student population it served and its radical reputation. Recording is of an interview with Mayor Derek Corrigan conducted by Kathy Bossort. Derek Corrigan was one of 23 participants interviewed as part of the Community Heritage Commission’s Burnaby Mountain Oral History Project. The interview is mainly about Mayor Corrigan talking about the history and value of protecting the environment and green space in Burnaby, and the different positions held by the City and SFU about land use and control on Burnaby Mountain between 1964 and 1995. He talks about the increasing awareness that a solution needed to be found that gave certainty to the protection of the conservation area on Burnaby Mountain. Mayor Corrigan also talks about what conservation means to him, the role that the Centennial Pavilion area plays on Burnaby Mountain, and the future for the urban forest on Burnaby Mountain. Other topics include his childhood, education, formative events in his life, and his career in politics. Derek Corrigan was born and grew up in Vancouver. He attended a number of elementary schools in East Vancouver, Queen Elizabeth Elementary School (Gr. 4-7) and Sir Charles Tupper High School. He attended UBC, majoring in philosophy and political science, and after travel in Europe, successfully applied to enter law school without completing his bachelors degree. He graduated in 1977, articled with Jim Lorimer in Burnaby and was called to the bar in 1978. 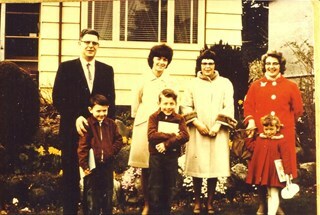 In 1977 Derek Corrigan and his wife Kathy moved to Burnaby, first to the Stoney Creek neighborhood and then to a home on the South Slope where they raised their family of four children. Derek Corrigan first ran for Burnaby Council in 1979 with the Burnaby Citizens Association, and after three more tries was elected to council in 1987. He has served Burnaby for 28 years, first as a councillor and then as mayor since 2002. During his career he has served on many committees at the local, regional and national levels. 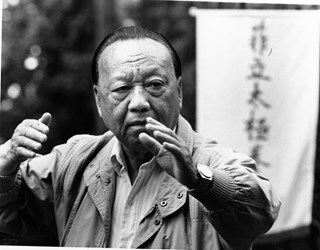 Photograph of Ken Fung, practicing Tai Chi in Burnaby's Central Park. 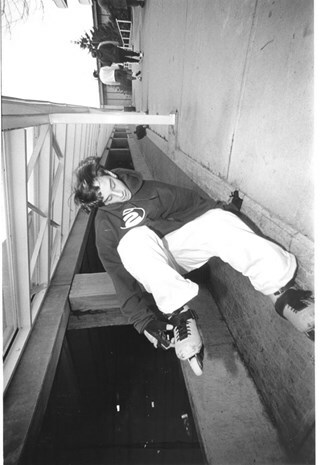 Note in black ink on recto of photograph reads: "1645 Bby Mario / NW13 60%"
Photograph of Graham McLean, skateboarder at a skate park in New Westminster. Note in black and blue ink on recto of photograph reads: "NW Steve Bby 3 80% / 1418"
Photograph of an unidentified boy riding his skateboard. 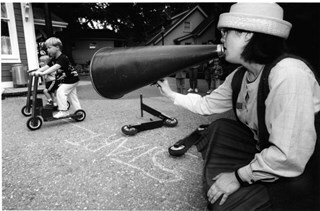 Note in black ink on recto of photograph reads: "Bby 3 94% / Bartel NW 2601"
Photograph of Kellie Haines holding up an old fashioned bullhorn, ready to say "go" for the contestants in a scooter race at the Burnaby Village Museum. Note in blue ink on recto of photograph reads: "Bartel Bby 1514 / 73% Bby p. 10"
Accompanying caption reads: "July 29, 1998 1514: / Kellie Haines of the Burnaby Village Museum lines up contestants for a scooter race down Main Street. This weekend there will be three days celebrating BC's past including a fashion show and garden tea on Monday. Article "Blast from the Past."" Photograph of Delores, Gerty, Iris, Jean, and Lillian standing on the playing fields, playing a game. Photograph of a group of boys keeping cool by dunking their heads in a tub of water. 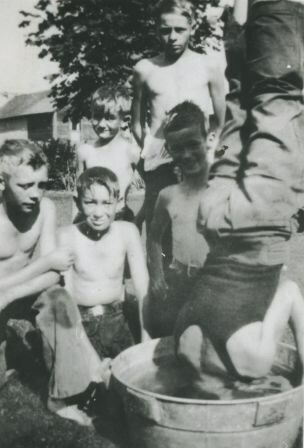 Identified: (back, standing) Oliver Younger, (middle, standing) Gordon Morash, (front, left to right) Alfie Younger, Erin Lee and Ralph Morash. The boy with his head in the tub is unidentified. 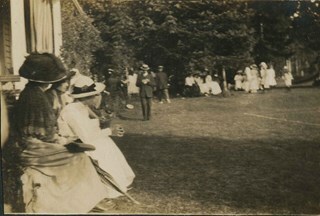 Photograph of a group of people on the lawn of an unidentified house, possibly the family home of Claude Hill, Broadview. 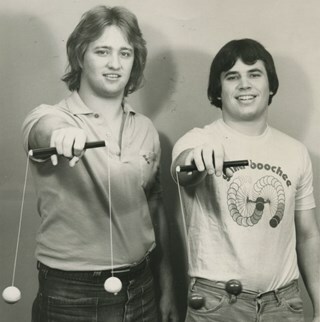 Photograph of Simon Fraser University students Bud Keys and Lorne Davies Junior standing side by side, each with their invention, the Yaka boochee in their right hands. 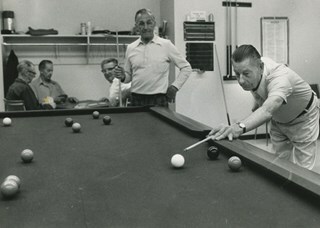 Photograph of Axel Erikson and Stu Spiker playing pool at Edmonds House as a group of men plays cards at a table in the background. This most likely the site of what is now Edmonds Centre. 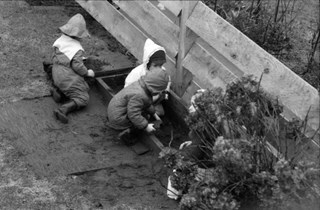 Photograph of four children playing in a sandbox. None of the children are identified although it is likely that this photograph was taken at our near the Johnston family home on Venables Street. Photograph of Shenaz Lakhani (left), Amber Hembruff, Patrick Montgomery and Chris Hall visiting the Forest Grove Elementary School at the Friday night drop-in centre. 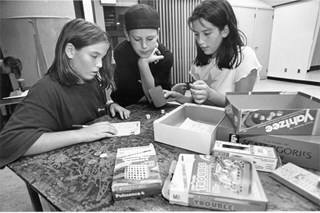 Note in black ink on recto of photograph reads: "93% Bby 1 / Bby Mario 2919 A"
Photograph of Shenaz Lakhani, Chris Hall, and Amber Hembruff playing Yahtzee at the Forest Grove Elementary teen drop-in centre. 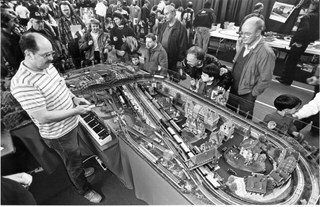 Photograph of Mike and Galen Montesano looking at the NorWest Club's 1930's model steam engine circle track at the Model Rail Bonanza at Cameron Recreation Centre. 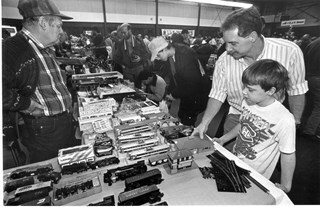 Note in black and blue ink on recto of photograph reads: "Bby 1 86% / Bby Brian 3145 B"
Photograph of people looking at the Model Rail Bonanza at Cameron Recreation Centre. Note in blue ink on recto of photograph reads: "3145 Bby Brian C / 88% Bby p.1"
Note in blue ink on recto of photograph reads: "Bby Brian 3145 D / Bby 3 86%"
Photograph of Tanishah Bardal during a skating lesson at Canlan Ice Sports Burnaby 8 Rinks. 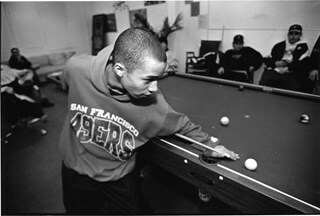 Note in black ink on recto of photograph reads: "Bby Mario 2912 72.5%"
Photograph of an unidentified boy playing pool at Edmonds Youth Resource Centre. 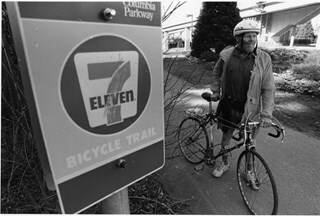 Note in black and blue ink on recto of photograph reads: "Bby Mario 321A / 02/11 BNW p. 9 80%"
Photograph of Burnaby environmentalist Dean Lamont on the 7-11 Bicycle Trail at Patterson SkyTrain station next to Central Park. The trail follows the SkyTrain route to New Westminster. The trail is part of the British Columbia Parkway. 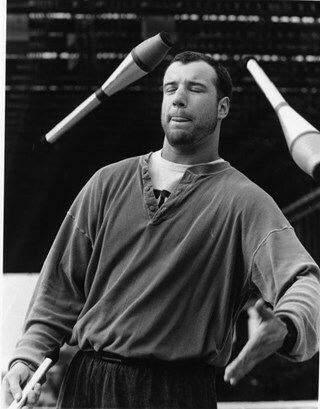 Note in black ink on recto of photograph reads: "Bby Mario 729A NW - 8 - 53%"
Photograph of Derek Moore caught practicing juggling with his eyes closed and tongue out. Derek is a member of the Simon Fraser University Juggling Club. 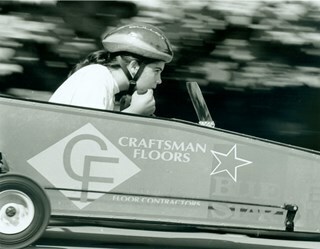 Note in black and red ink on recto of photograph reads: "Bby - 5 - 82% / Bartel Bby 806"
Photograph of Nicola Jackson riding in a soapbox sponsored by Craftsman Floors in a derby at Deer Lake. 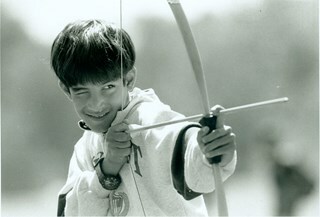 Note in black ink on recto of photograph reads: "07/03 Bartel Bby 1712 A p. 1 83%"
Photograph of Aadam Tejpar, 8, practicing his shot with a bow and arrow at Simon Fraser University's 'mini university' day camp. 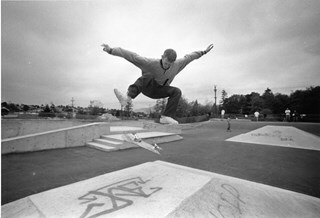 Note in black ink on recto of photograph reads: "Bartel Bby 1893 / Bby 3 85%"
Photograph of Drew Hudson skateboarding at the new skateboarding facilities at Confederation Park. Note in black ink on recto of photograph reads: "2448 Bby Rebecca / Bby - 1 66%"
Photograph of an unidentified boy rollerblading. Note in black ink on recto of photograph reads: "3105 Bby Rebecca / 12/18 68% p. ? " 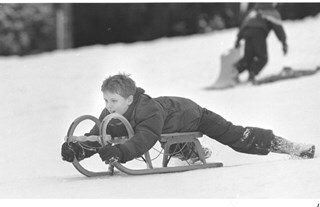 Photograph of Ethan Foster sledding down a mountain. Note in black ink on recto of photograph reads: "Bby Brian 0015 A / 76% Bby 19"